Looking forward to the next couple of weeks and I am nothing but excited. Dublin has treated me well in this time and I am about to embark in many new adventures. Barcelona, Paris, London and Brussels are all on the list before I return him to Reno, NV. I want to share with you my plan for this blog before I start my travels again.I started this blog with some hesitation. I was worried too much about my writing style or how my punctuation would come off to others, but I have learned not to fret over the little things. I haven’t written much lately, but I enjoy it. I like writing about what I see and feel during my travels. I do it to share these stories with you and hope you can relate to my experiences, or that you might want to check out the places I have been to before. So this is the plan, I want to keep this blog going and only improve it from here. I want to add pictures from my recent travels and write reviews about what I did in my time there. I enjoy taking pictures and I enjoy finding new foods to try, along with new people to meet. It is all about getting out there and embracing what life throws at you. It’s about realizing you are meeting those people for a reason and you can gain a lot from them as you learn a little bit about them. So keep a look out for posts to come, I can’t wait to start writing them! Cheers and thanks for reading! Well here we are, approaching my last few days in Dublin. What to do… Well there is a lot I still want to do. Some things that I haven’t seen. 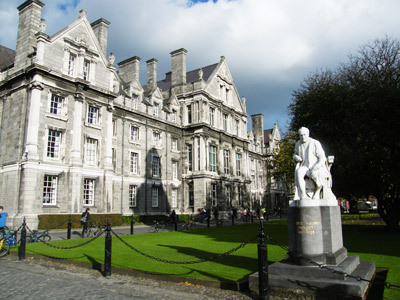 I need to eat Corned Beef and Cabbage, I need to take a tour of Trinity College (yeah, I know… I live here, but I have out off the tour this whole time), and I need to walk to the bay. So I thought about why I haven’t done everything I wanted to do yet, and I’ve put together a little list of tips that I feel I could have done better and tips you can use if you are ever get a chance to study abroad. If you have homework, do it early. I have spent some days just trying to catch up on homework because I have decided to sleep in. It just wastes away the afternoon, where I could be walking around and taking a tour of something. So get it together, and get it all out-of-the-way. You don’t want to miss out of something during your stay because you were procrastinating. Apply what you are learning. If you are learning business, economics, and or even art, I’m sure there is a way to apply what you are learning to the city you are studying in. You can look at how the economy is, or how some businesses are run in different countries. Talk to people about topics that you find interesting and try to relate them back to your own country. By comparing them I feel like you can get a different glimpse into the lives of those around you. I enjoy it! I personally enjoy going to local street markets to try new foods, and buy random things you can’t find anywhere else. Tripadvisor helps a lot because you can get a lot of feedback from people who have been there before, you can judge if it’s something you would be interested in doing before you actually go. So look for concerts, festivals, food, anything! Heck, I even researched dog races and found that it was a great night out in Dublin. Make notes of it and ask around to help find it. My list is enormous and it gets bigger as the days go by. A lot bigger. If you have a phone that can get apps, then I suggest you get any and all apps you can about the city you are staying in. This day-in-age most cities are on-board with the popularity of app downloading. PocketGuide is a good one that I found. Basically, you walk the themed route of your choice, and as you get close to each building or historical site the app will play audio telling you more about what you are looking at. It’s like you personal tour guide in your phone, pretty cool! Vouchercloud is a good one too, it has plenty of coupons for food and attractions that help save money. Wandering aimlessly wont kill you. When you have a free day walk around and see what you can find. I do it all the time. I’ll walk for an hour in one direction, and take a different street back. 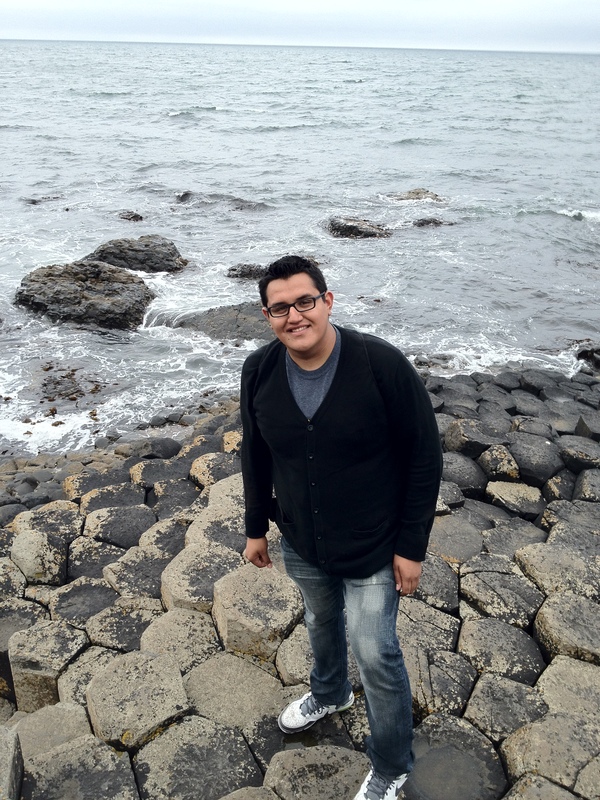 I stumbled upon some pretty cool things while doing this including Croke Park, The National Gallery of Ireland, Merrion Square Park, and the best burrito in Dublin. You just have to trust yourself on getting back and you can find some great little dives that you wouldn’t ave noticed any other way. The Streets of Dublin are filled with new and exciting things, I’m sure you can find something new in your city. That’s the short list for now, there are more to come as I finish up my time here and reflect on it later. I hope these help you out in your time studying abroad. Cheers! P.S. if you have any search tools or apps you use, share them below! That’s right, I hold the title of being a Guinness World Record Breaker. For what you may wonder? Well, lets say I put on of my many talents to good use here. Not my good looks, or my joke telling ability, but it was my appetite. Now that I have you built up with suspense, I’ll share it with you now. I ate a bowl of cereal. 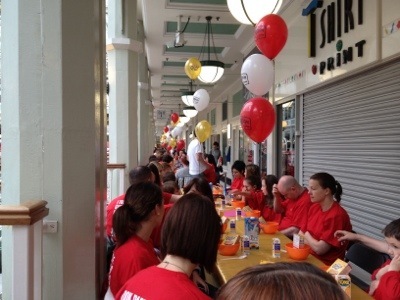 Not quickly or some excessive amount of it, but I was among 425 people who gathered at St. Stephens Green Shopping Centre to enjoy a bowl of Crunchy cereal. It was a last-minute flyer that I noticed and thought to myself – you can do this, the possibility of success was on my side. Plus, holding a world record title feels pretty cool. 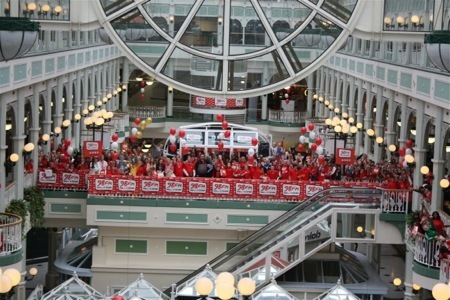 Anyways the even was fast and it was hosted by 98fm, a local radio station in Dublin. we cued in a line and took our place on the second floor. Everything was laid out nicely and there were a lot of people ready to do the damn thing. I wasn’t seated long before we were told to start. 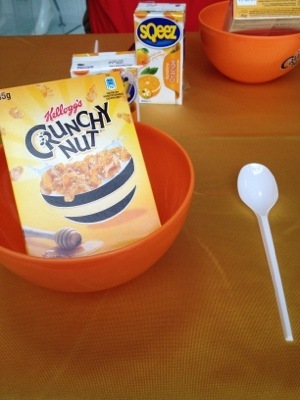 the rules were simple, everyone had to eat at the same time, all your cereal had to be done, and you can hep each other out if necessary. Given that we had a tiny box I don’t think any helping was needed unless you hated the cereal or something. The previous record stood at 375 people. After a few minutes of waiting, the radio announcer got on the microphone and let everyone know that we had succeeded. We were all participants in the World’s Largest Gathering for Breakfast. A round of applause was given and pictures were taken. I know it’s kind of a cheesy record to hold — but hey, I can always use it when I have to say an interesting fact about myself during an icebreaker or something like that. It was a good day. I got a cool certificate, got a nice t-shirt, an extra box of cereal, and a big orange bowl to eat it in. I’m on the hunt now to see what other fun World Record attempts I can partake in, it can be a new hobby or something. I traveled alone for no real purpose. I kind of just left. It was an experience and I still find it hard to believe that I did it, especially since I can’t go too long without talking to someone. I am a social person and I enjoy spending time with my friends and family the most. In Belfast I booked a tour to the Giant’s Causeway on a whim, I needed something to do and this fit the schedule. This post is meant to share the reflection of the tour and how things kind of, well just happen for a reason. Just one of the amazing views. Going back a few days prior to my tour I met Beth and Robert, the two nicest elderly couple I had been fortunate to sit next to during my flight to Ireland. Both of them loved to travel and were looking forward to enjoying all the country-side of Ireland. I was on my way to see Belfast before my month-long study program in Dublin. Beth was a sweetheart to say the least. She really made my flight an easy one. Once our flight lands and after a few hugs we went our separate ways. I’ll explain why this is relevant to this post a in just a second. 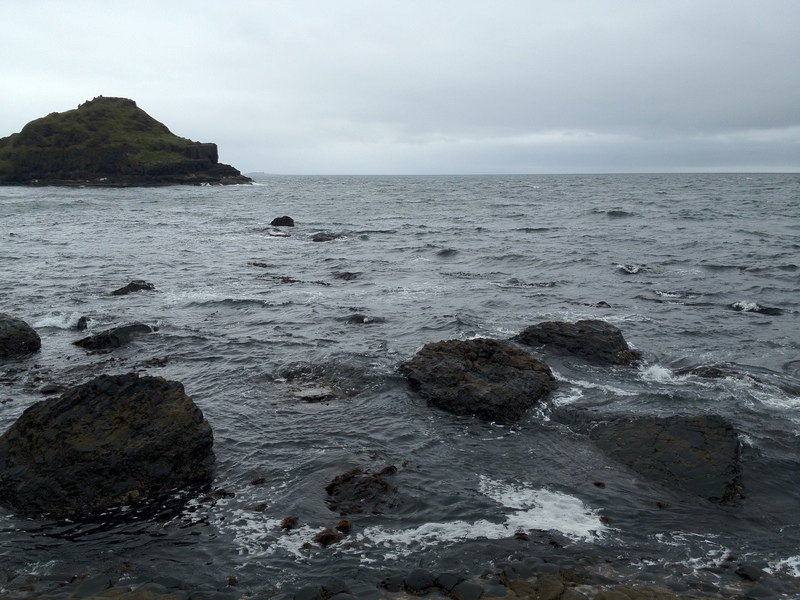 Stops along the way including the Ballycastle, Carrick a Rede Bridge, Glenarm, and Giant’s Causeway. All this would not be complete with a stop for some whiskey right? The tour includes a food/drink stop at Bushmills Distillery! The Giant’s Causeway was of course the main event of the trip, and it did not disappoint. The structures of the rocks look like a bunch of hexagons put together in only that one spot. It must be a geologist’s dream to see this. 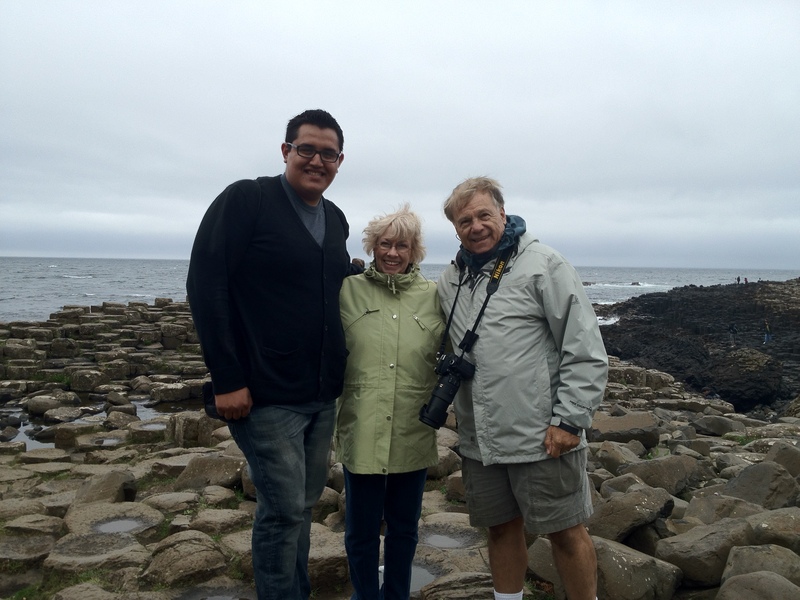 As I was taking pictures and jumping around all the rocks like a kid in a jungle gym, I bumped into a familiar couple. Can you guess who it was? Yup, t was Beth and Robert, this time joined by their son and daughter-in-law. It was such a random event because while I stayed in Belfast for a couple of days, they had done some of their own traveling too. We could have gone on any other day, but it just happened to be the same one. I enjoyed catching up with them again and seeing how their trip was going. Before saying goodbye again, Beth gives me a hug and tells me to take in every moment and enjoy my life. She recites a quick little pray for both of us, which was so comforting, at this point in my loneliness I needed it. I got a picture with Beth and Robert! 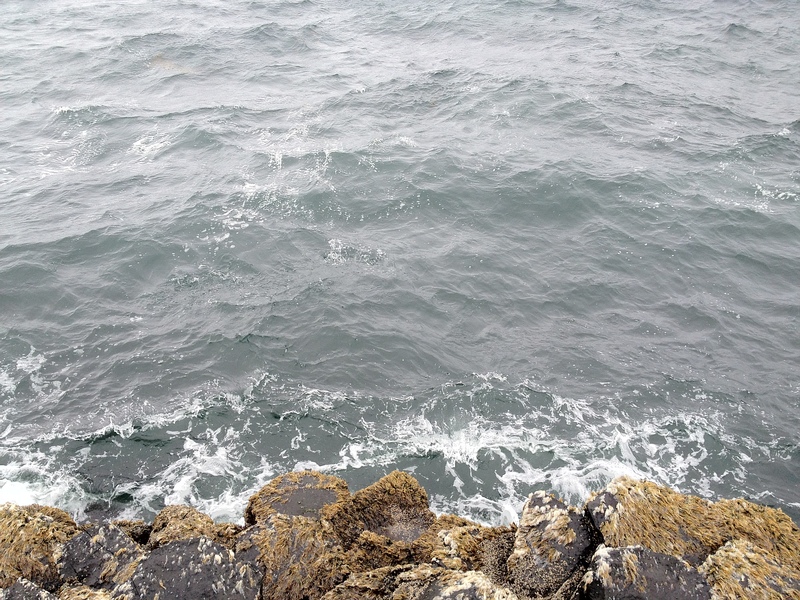 I began a hike to get a better view of the ocean. Now comes the reflection part, I reached the top and took some pictures, when it hit me, I just stood there and thought – about what, I’m not sure, it was a mixture of everything. I saw my Grandpa, I wished I could have said goodbye. I saw my parents and saw how much they have done for me and how much I missed them. I saw my girlfriend and pictured us at that point holding hands (yes, I’m sensitive soul, don’t judge.) I missed my brothers and all our crazy nonsense. I looked at my school work, at where I wanted to be in the future, at what I could have done better. All this was going on in my head and the wind was blowing. I still can’t describe the thoughts that were going by, but all I can say is that I enjoyed it. This is where I really learned that I am a social traveler, as I mentioned earlier, I enjoy time with my friends. While I thank the solo trip for giving me time to think, I would rather travel with someone. I think way too much to myself to be alone. I almost have to talk to myself to feel some sort of relief before my head explodes. I love company and nothing would complete a great vacation better than traveling with someone who would enjoy just as much as I would. All the chaotic thoughts amounted to one thing – everything happens for a reason. I bumped into Beth and Robert for a reason, the prayer Beth recited is was what lead me to reflect on what I was already blessed with. So if you read this, I want to say thank you! Where am I going with this? I don’t really know yet, but I feel like everyone should take the time to reflect and figure yourself out. You wont know what you can’t be without until you are really alone. I had no iPhone to bug, no Facebook to glue my eyes to, no text to distract me, it was just me, myself, and I.
I’ll end this post on that note. I’ll post a review of the actual tour (I know, you’re dying to hear more about it) a little later this week, but for now I am satisfied. Thanks for reading and I hope you enjoyed it. Leave a comment if you would like, any thing you want to say, I would enjoy reading it. Titanic Belfast, the world’s largest Titanic exhibit, hands down, is the highlight on my time spent in Belfast, Northern Ireland. From praise to criticism, from celebration to tragedy, Belfast has experienced it all. 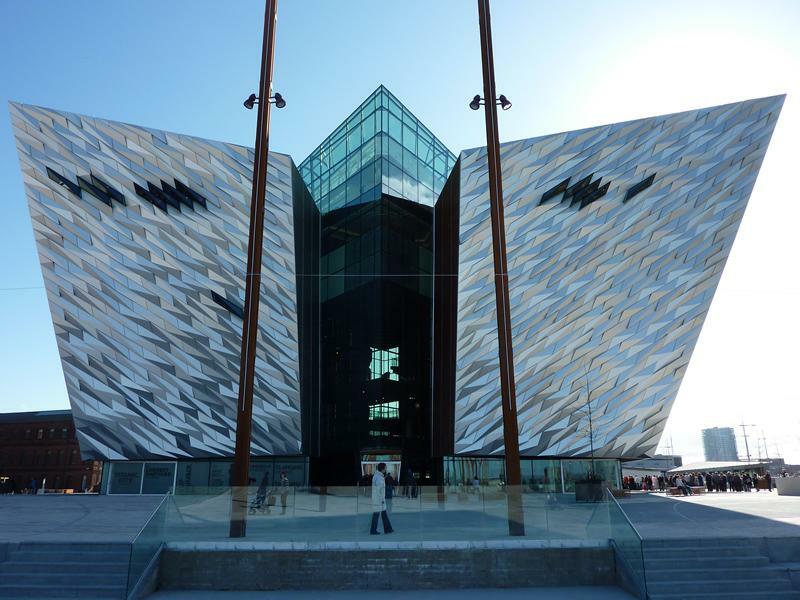 The Titanic is more than a movie, it kind of carries with it the entire spirit of Belfast’s citizens, and you really see that once you have gone through this exhibit. The building looks like Epcot‘s distant cousin. It’s shiny, modern, and gets you excited to see what the inside has in-store for you. Not only is the design epic, but it’s location is awesome. 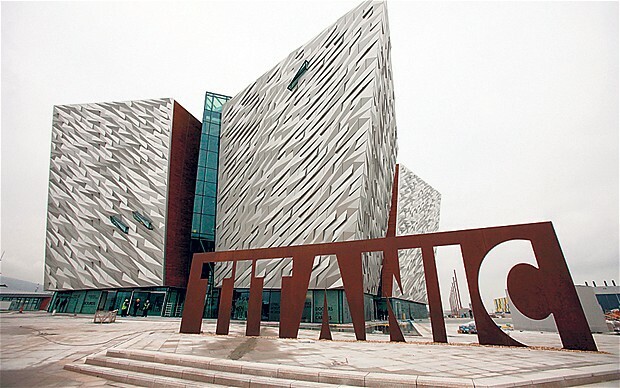 It’s located exactly where the Titanic first touched water, to the right of the building is where the actual ship was drawn up, and also it’s next to the river where is actually set sail for its maiden voyage. Next comes the inside of the building. These are the galleries it take you through– Boomtown Belfast, The Shipyard, The Launch of the Titanic, Fitting Out the Ship, Maiden Voyage, The Sinking, The Aftermath, Myths and Legends, Visit and Explore the Wreck, Oceanic Exploration Centre. Nothing is boring or dry. I didn’t want to leave this place at all. I read every little excerpt about every little thing. I figured the easiest way of sharing a little bit about each gallery was to divide them up into groups. Starts with the industries that Belfast become known for. It was an all important city for its quality linen and whiskey.The projections are easy to read and do a great job of showing the detail and amount of work it took to build this ship. It even has a shipyard ride that takes you through the smells and sights of a real shipyard at that time. After you see the shipyard they share stories of the famous engineering company Harland and Wolff . Once you see the building of the ship you then enjoy a full virtual-tour of the inside of the ship. 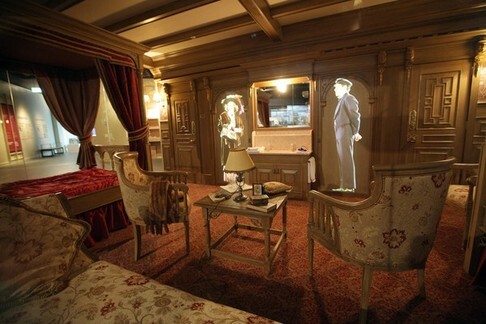 It lets you know what each room looked like in every class and hear more stories about real people who boarded this ship. When the Titanic set sail everyone was filled with joy. All excited about what the city of Belfast could accomplish. Then tragedy strikes, the Titanic sinks, and the fall of Belfast begins. No one trusted the city anymore and they a cloud of depression seemed to torment Belfast for decades. I was really interested with the survivor interviews they had because I was listening for real accounts of what happened that night. It seem like Belfast wanted to bury it and nobody wanted to talk about what had just happened. As the end of the exhibit approaches you get to see the movie interpretations, including James Cameron‘s blockbuster movie Titanic (Even the most manly man has seen this movie, if you haven’t your living under a rock.) After taking in some hollywood interpretation, it is finished with the discovery of the Titanic’s remains video. Awesome to see what they have discovered. Then the exploration is in your hand when you are able to guide an underwater camera to explore the ocean floor and see what you can find. All in all, this was awesome! It felt like I found out everything I needed to know about Belfast and was glad to see that a city that was so broken after a tragedy, was able to come back full force to build this exhibit. The grief was over and it was time to share this story with the world and move on. In some museums or exhibits I have to force myself to pay attention and not rush through anything, but not here. The three hours I spent there were all worth the trip and I quenched my thirst with a Titanic Quarter Beer! Yes, they have their own beer and it’s yummy! – Too many to count. It’s interactive and a lot of fun. – None that I found on my visit there. – If you haven’t guessed it already, I say yes! I would recommend this to anyone and everyone. It’s interactive for everyone and easy to learn. – Book early! The tickets sell out often during the weekend. They monitor the influx of people by creating time slots you can choose from. So arrive to your assigned time early. – Eat there! the food is reasonably priced and very delicious. I would add a beer as well, I don’t think you can find it anywhere else. I hope this helps you out on your journey to Belfast, Northern Ireland. Let me know how you enjoyed the visit! Cheers! Trying to find a topic to talk about, I couldn’t help but think of things that I’ve always wanted to do, so what better thing to do than to create a bucket list. I have never really made one before, I’ve always just had random goals that vary throughout the year. It ties with my post, taking travel to the workplace, because just like I have been lacking discipline in the workplace, I have lacked some discipline with my own goals.I tend to think of goals, but after a few weeks go by I can’t remember what they were. So I want to share my bucket list with you all and I hope you share some of the most important things on you bucket list with me. I hope this will help me stick to my goals, because I hope to blog about most, I’d not all of these experiences. If you see that they aren’t being done, feel free to send my a message and tell me to get my act together! I won’t be mad. -Visit my family in Mexico. It’s been almost four years since my last visit and I miss them a lot. Dia de Los Muertos especially because I would love to participate in celebrating my grandfathers life after he passed last year. -Finishing my first half-marathon. I’ve been training for Disneyland Half-Marathon so wish me luck! -Read more books. I don’t care which ones, I just know I do not read enough. –Walt Disneyworld Food and Wine Festival. Who wouldn’t want to enjoy this? I know it’s short, but I think it’s a great start. 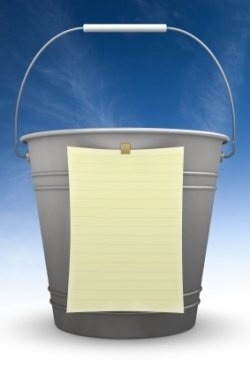 What’s on your bucket list this year? Let me know with a comment below! There’s a first time for everything. And today I have the opportunity of sharing my first time watching and betting on Greyhound races. And let’s say it’s a pleasent experience. 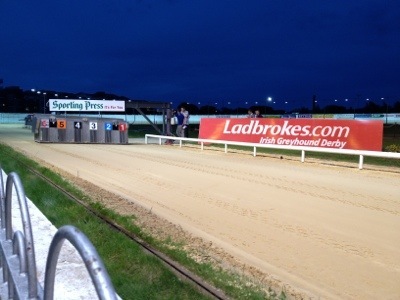 Like my previous review of Things to do in Dublin, I will share my thoughts on my night at the races, while I can’t give you any advice on what dog to bet on (trust me, you don’t want my terrible advice on this topic), I will share little secrets on making this night a great night out with friends or family. Greyhound racing has become a popular sporting event in many European, including Ireland, as it plays a large role in their gambling activities. The race starts with a maximum of six dogs on the track. A buzzer rings, at which that point the electric hare starts. Once the hare reaches the dog cages the dogs are released. In the race I watched each dog was to run one lap and that was how the winner was determined, but the distance can vary depending on where you go. Shelbourne Park. Shelbourne Park is just a 15-20 minute walk from the Temple Bar area, which is nice because no bus or taxi transport is needed. A race is held each week on Wednesday, Thursday, and Saturday. The night features 10 races that you can bet on and the minimum varies, not usually more than €2 a race though. -It’s a fun nigh out with everyone. Each person can pick a dog for fun and have a great time screaming for their dog to take home the race! -The staff and locals are friendly and knowledgable. I was pretty clueless on where to start the betting, but had all my questions answered by the staff. -Nothing to do with the actual race. The only issue was that because of the heavy rain the mechanical hare was having issues taking off, which made the time between races a little long, but nothing a pint of Guinness couldn’t fix! -Research! I didn’t really mind betting on each dog because it only cost €2 a race, but having more knowledge of how to pick a dog would always be nice. -Book online! The deal of the month (click here to see what is being offered) was great and was only available online. For June, I got a beer, burger, chips, and my entrance fee for only €10. Nothing beats that deal so make sure to take a look online to find out the deals. It depends. If you have time to enjoy Dublin, then I would stop by for sure. If you only a few days to see Dublin ten I would recommend seeing more historic landmarks over gambling. I hope this helped! Leave a comment and let me know how much you won or lost at the races! 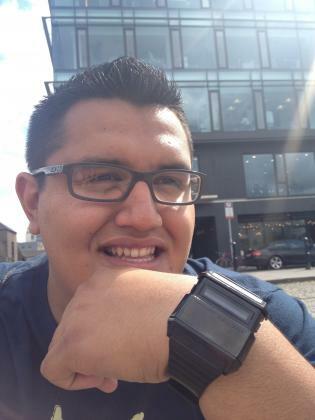 A University of Nevada, Reno student pursueing a Business Management & Economics degree. I also enjoy traveling because you can gain so much from visiting a new country. I look forward to sharing those experiences and gaining new ones.